Versatile, comfortable, and easy-to-pack—you’ll want to add these fall dresses to your packing list immediately. Leota is a New York-based, women-led company that creates the most travel-friendly dresses I’ve ever tried. Its signature breathable jersey fabric is wrinkle-free, machine-washable, lightweight, and not even close to being see-through. The fabric is perfect for fall weather, and the dress designs all look super polished. The Noveau Sheath Dress is ideal for travel, since it’s reversible—wear it as a V-neck or high-neck style, depending on where you’re going. The Perfect Wrap Mini Dress is indeed perfect, as it’s a faux-wrap style that you don’t have to worry about coming open or undone. Both dresses come in a variety of eye-catching and fun prints that make for great travel photos. Tired of fall dresses that don’t have pockets? SCOTTeVEST’s Debbie Dress has seven pockets, including ones for large phones or passports. The pockets are designed to be “no bulge” so the dress won’t make you look bulky even if you’re carrying a lot. Prefer a more modest look? Check out SCOTTeVEST’s Deborah Dress, which is the same design in a longer length. This hoodie dress feels like wearing a sweatshirt, but looks a lot more polished. Pair it with some fleece-lined leggings on your next long-haul flight and you’ll feel almost as comfortable as you would lounging on the couch at home. Always have to tailor your fall dresses to get the right length? Skip that step by ordering eShakti’s Cotton Knit Midi Dress, which is made-to-order, so you can customize it to your size and height. Flannel just screams “fall,” and wearing it in dress form ups the style quotient. Eddie Bauer’s Favorite Flannel Shirt Dress is made from a super soft and extremely warm premium cotton flannel that just might make it your new favorite fall dress. 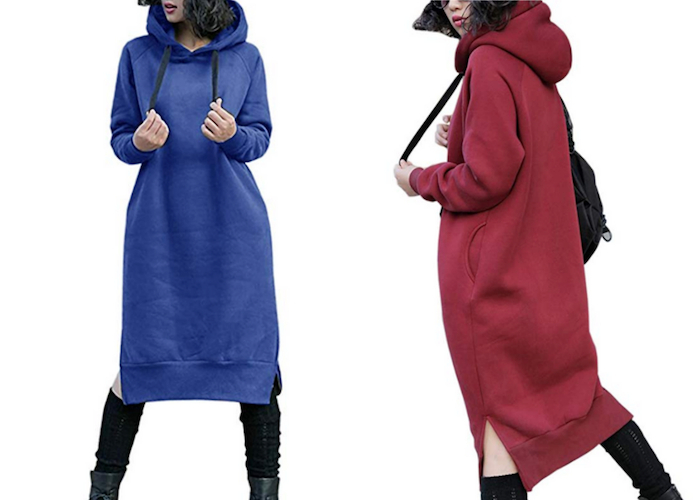 Available in every color of the rainbow, this hoodie dress is lined with fleece to keep you warm on even the coldest fall days. This plus-size dress comes in a range of sizes that will fit nearly everyone, and is also extremely affordable. Turtlenecks are ultra-trendy right now, and so is the Three Dots Heritage Knit Turtleneck Dress. Made of a lightweight knit cotton fabric, this fall dress is great for travel thanks to a classic silhouette and all black color that goes with anything. Long sleeves and a maxi length will keep you warm—and looking stylish, especially in the Rimini Long Sleeve Maxi Dress. An adjustable drawstring waistband allows you to get a custom fit, so you can decide just how snug-fitting you want the dress to be. prAna’s Macee Dress is made from a stylish textured jacquard knit that resists wrinkles and will hide most stains. Although made from a lightweight polyester/spandex blend, this dress is surprisingly warm. Caroline Morse Teel loves fall dresses for travel. Follow her on Instagram @TravelWithCaroline for style and travel photos from around the world.